CARMICHAEL, CA--(Marketwired - Mar 18, 2014) - Swinerton Builders joined members of the Jesuit High School community in Carmichael, California, today to celebrate the topping out of the new Chapel of the North American Martyrs at the campus of one of Sacramento's premiere college preparatory schools. 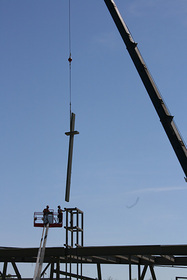 In a unique departure from the industry tradition of placing the final steel beam during a topping out ceremony, Swinerton Builders instead lifted a giant steel cross that will adorn the roof of the new chapel. Swinerton Builders broke ground on the 10,500-square-foot chapel in the fall of 2013 and plans to complete construction this fall. The modern design consists of a steel-braced frame structure with an exterior skin of glass curtain wall, plaster-on-stud framing, and a cement panel "rain screen" system. Built on a six-acre parcel fronting Fair Oaks Boulevard, exterior and site improvements including a large plaza concourse with a reflecting pool and drought-resistant landscaping will add to the serene sense of place. With many sustainable features, the project is targeting LEED Silver certification. When beginning the chapel project, Jesuit High School administrators envisioned a place for both quiet reflection as well as liturgical celebrations. "We are truly excited to see our long hoped-for dream of a school chapel becoming a reality," said Jesuit High School president, Father David Suwalsky, S.J. Along with general contractor Swinerton Builders, the architectural firm Hodgetts + Fung of Los Angeles was selected to bring the Jesuit's sacred vision to life. About Swinerton: Swinerton provides commercial construction and construction management services throughout the United States and is a 100% employee-owned company. Recognized nationally since 1888, Swinerton is the preferred builder and trusted partner in every market it serves -- proudly leading with integrity, passion, and excellence. For more information on Swinerton, visit its blog, Facebook, Twitter, Flickr and LinkedIn. Swinerton Builders lifts a giant steel cross that will adorn the roof of the new chapel Chapel of the North American Martyrs.